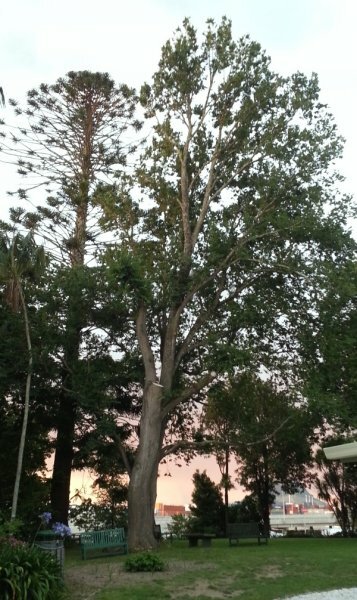 This elm is located in the grounds of The Elms Mission House at 15 Mission Street on the northern point of the Te Papa Peninsula, Tauranga. It is listed as tree T229 in the Tauranga City Council, City Plan, Notable Trees Register. The tree is a sucker from one of the last original elms that was removed in 1952. This sucker was protected by Alice Maxwell c.1945 , and is near the location of one of the original elm trees at the site. This historic connection to the original elm trees (the trees the mission was named after) makes this tree more significant than its 68 years would usually dictate. Being the last large elm in the mission grounds, two vegetative cuttings were recently planted near the Mission Street road frontage to the west of the main entrance. 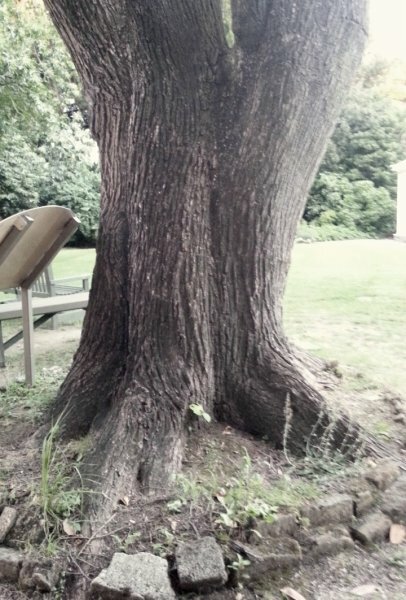 This tree has a single trunk (a fusion of two stems) from the ground before the crown break where three leaders form the upright spreading crown. The southern leaders were pollarded in early 2012 due to a large crack between the southern leaders. Originally some weight reduction was carried out and a cable installed (c.2004), however the crack kept deteriorating and the more drastic treatment was taken to preserve this important tree. The heavy pruning has left the crown somewhat asymmetrical (Sale, P.O. 2012). The property has several historic trees. See group listing BPR/G1062 for more information on the history of the site. Ref:Maxwell, D. (1978). The Garden Book. The Elms Trust Library. 05 Jan 2013 Sale, P.O.